This paperback book shows normal wear and tear. This paperback book cover has stickers/sticker residue on it. The cover is different than what is shown in the picture of this listing. The edges of the pages have markings, spots, or stains. Shipped to you from Goodwill of the Valleys, Roanoke VA. Thank you for your support! Good. 0767913736 Ships promptly from Texas. I was truly flawed by this book. I knew little about T.R. a true explorer of his kind. The writer wrote flawlessly and kept me going all the way. As an avid reader when i find a book this good i purposely slow down my reading so i may make the book last longer. I highly recomend this book going to the Amazon is exciting,dangerous and down right scary as well as beautiful read this book it will never let you down! You have to ask yourself if Theodore Roosevelt had a death wish. On the trip down the ?River of Doubt? in the Amazon, (which was funded by the American Museum of Natural History), two members of the party died en route. (One was murdered, the other fell overboard, and the body was never recovered.) In the process, an unknown river was ?discovered?. Of course the native tribes in the area didn?t need anyone pointing out what they knew already. It was for the voracious Westerners, who licked their chops at every new extractive possibility, that this was big news. Mr. Roosevelt had a very hard time of it on this journey. The rainforest was an unfamiliar environment. The author, Candice Millard, went to great lengths to describe the unforgiving and delicate nature of the bio-system that greeted the explorers in 1914. The former president, who prided himself on self-sufficiency, barely made it out of the jungle alive. And, the diseases he carried with him afterward, from malaria to infections, finished the job, because he was dead by 1919. Theodore Roosevelt was not your run-of-the-mill wealthy Republican. Although he was brought up in privilege, once he left the mansion in Oyster Bay, he carried his own weight. That?s not to say that he did as much work as the camaradas, (who were hired to do the lugging on this particular expedition), but he was more than willing to help out when the need arose. Of course everyone remembers Mr. Roosevelt as our most famous Progressive, (using the old definition of the word, because he was not a leftist). If you really examine the record he was quite moderate by modern standards, (especially in comparison to the socialists and Wobblies of his day). He did enforce the antitrust laws, (once or twice), and he did commence with federal food inspection, (after reading ?The Jungle? by Upton Sinclair). However, he needed a little prodding on the issue of child labor, (in the form of a children?s march led by Mary Harris ?Mother? Jones). And he rarely found himself agreeing with the unions. 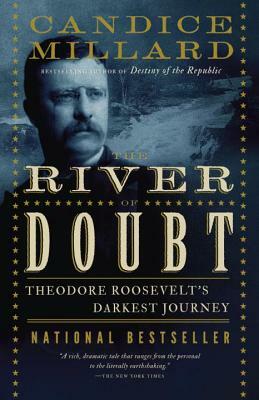 But Roosevelt?s political life is not on trial in this book. But none of that will detract from your enjoyment of this book because the author will put you right in the dugout canoe. You will feel the sweat on your neck. The humidity will soak through your clothes. You will picture yourself sleeping with one eye open in the night listening to the hooting and growling of animals. You will never look at a body of water again, without thinking of the danger that lurks beneath the surface. That is why despite my political misgivings regarding Theodore Roosevelt I have to tip my hat to his bravery. This fifty-five-year-old could have spent his remaining years on the cocktail circuit, going from one soiree to the next, or hibernating in his library. Unlike other excursions, (which included a ?Safari? or two), his mission was not the killing of animals for the sheer pleasure of it. Whatever wildlife was taken was for survival only, (other than samples for the museum). He went into this project with a slightly racist attitude regarding Hispanics. He came out of it with nothing but respect for his foreign hosts. They literally saved his life and protected him from harm. The image of his humility runs counter to our common perception. But then again, how well do we really know our historical figureheads? How much of what we are force-fed in school hangs on to prejudice our judgment later? Candice Millard should be commended for a job well done. This is a book for the ages. If you enjoyed reading books about Earnest Shackleton's expedition to Antarctica, you will love this book. It draws you in from the first page and you feel as if you are along on the adventure. Not only do you get to know the adventurers themselves, you get a lesson in geography, botany and entomology. And let's not forget the fish and reptiles! All the better because it is based on true events and featuring one of America's larger-than-life presidents, Teddy Roosevelt. Hope you have a long weekend to read this---you won't want to put it down until you know how it ends. One of the most interesting, well-written books we've ever read. A fascinating picture of Teddy Roosevelt, creatures of the Amazon jungle, interpersonal relations in a hazardous environment and more. Wonderful read! The writing is a bit uneven - feels like a collection of articles and essays - but the story keeps you reading. Similar to Shackleton's expedition, some of their experiences were unimaginable.